Welcome to the induction ceremony of the first class of the Venezuelan First Name Pantheon. Rule no. 1: First names, and only one word. Forget about Carlos Andrés, Chávez or Uslar. Rule no. 2: No nicknames or stage names. Apologies to Renny, Yordano, Joselo, and Kiara. Rule no. 3: The status is for life. Teenagers today might not recognize some of the inductees, but most people did back in their time. Rule no. 4: Usage matters. While you might know who Hugo, Ruddy or Nicolás are, no one calls them just that. We use their last name more often, or their full name. Are these standards unfairly biased against people with common names? You betcha. If you’re name is Luis, you’re just not likely to join this pantheon. Do we care? Not even a little bit. One of the most badass Venezuelans. Forced into exile three times by dictatorships, and served twice as president of Venezuela (once unelected, but we don’t talk about that). Hater of communists and dictators, he stabilized the country during the early days of our democracy, defeating several coups, and surviving an assassination attempt. And he did it all while smoking a cool pipe and wearing hipster glasses. Another member of the Generación del 28. Together with Rómulo and Caldera, he was one of the architects and signees of the Pacto de Punto Fijo. Unlike Rómulo and Caldera, he never made it to Miraflores. For a short while his party, URD, was the second party in Venezuelan politics. He ran twice for president, gathering close to 20% of the vote in 1963, and was regarded as a deep thinker and excellent public speaker by friends and foes alike. Few people have had such long life in Venezuelan politics and public affairs as Teodoro. During the early 1960’s he was a communist guerrilla fighter, was captured three times, and escaped twice from prison. One of his escapes included a Jason Bourne-like jump from a seventh floor. After being pardoned by Caldera, he went on to found a socialist party (MAS) and came a very distant third in two presidential elections. He completed the 180° turn in 1996, joining Caldera’s cabinet as Minister of Planning, and implementing an IMF-backed reform package. As editor of the newspaper Tal Cual, he became one of Chavéz’s most fearless critics, and later flirted with another presidential run in 2006. You know him. Always Leopoldo, never just López. He’s a good example of the First Name Status: there are chavistas, maduristas, and even caprilistas, but there are no lopecistas, only leopoldistas. He’s the most recent entry to the Pantheon (although not the youngest). Look, I’m sorry. I’d rather not have him here, but he made it. My favourite factoid about him is that as Vice President during the coup of 2002, he was sworn in as acting president while Chávez was being brought back from his spa treatments in La Orchila, while wearing a freaking fishing vest. Couldn’t someone loan him a jacket or something for a couple of minutes? He’s a polarizing figure: he’s either hated, or disliked. It depends on which side you ask. Aristóbulo was already Aristóbulo before he jumped on the Chávez bandwagon. He has worn many different colors during his long political career, but at least he’s been consistent: every jump takes him further to the left. Until his recent appointment as Vice President, he was the governor of a state in which he had never lived in before being elected. A champion parachuter. The 1981 Miss Universe parlayed a short but successful (and highly publicized) stint as Mayor of Chacao into a run for president in 1998. For a little while in 1997 she looked like a lock to win the presidency. 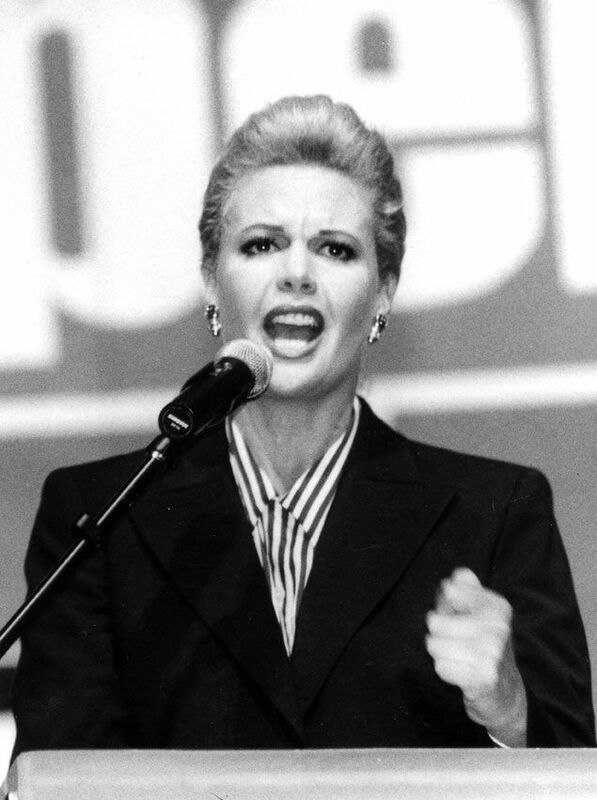 Her campaign got off to a rough start, especially due to an ill-advised turn as an Evita impersonator in the first rally. She didn’t recover from that, and also never managed to rub off the stink of being endorsed by the then very unpopular COPEI. She was crushed at the polls by some dude who was fond of red berets. What a loser. One of the most beloved comics and celebrities in the country (or at least among the non-chavistas). A smart and congenial dude, he also moonlights as a political columnist. If there was a prize for Most Shared Columns Via Whatsapp Groups and Emails Chains From Your Aunt, Laureano would win in a landslide every year. Nothing was bigger in Venezuelan show business than Sábado Sensacional in its prime, when Amador was the host. He ran the show for sixteen years, filling arenas all around the country. A YouTube deep dive of Amador’s clips is sure to leave you astonished (and depressed) of the top artists that would come to Venezuela back then. Or so they tell me. They are mostly known as a duo, but there’s only one Servando and one Florentino in Venezuela. They ruled the 1990’s. Most Venezuelan women in their thirties – with a little encouragement from a few stiff drinks – can still sing many of the songs from their back catalogue. Some guys can, too. It’s true; I’ve seen it. One of our true sports stars, he played for 13 years in the majors, and 18 in the Venezuelan league, where his record of most home-runs in a season stood for 33 years. His death in 1990, in a freak domestic accident, hit the country hard. I’ll admit to know very little about her. Just that she’s a famous singer, and has been active for longer than most readers of this blog have been alive. Ask your mom. Or your grandma. They’ll know. La Primerísima Mirla. Almost made it: Pompeyo, Maite, Osmel, Ilan, Aldemaro, Américo, Vladimir, and Emilio. Potential future inductees: Lilian, Marialbert, Norkys, Winston, Sumito, Cilia, Rayma, Lorenzo, Salomón, and Greivis.